Oh, hello there, Amy. How nice to hear from you. Something's obviously got your feathers all ruffled in 1950-something. Gee. Can't wait to hear what it is this time. ... and ride around on his motorcycle or hang out with his friends? You're going crazy without modern technology? Yes, I know you want me to time travel you back to the 21st century as soon as possible. Unfortunately, it's not an easy thing to do. Not yet, anyway. Getting time travel coordinates correct is an incredible challenge, and certainly not an exact science easily dealt with. Time travel involves moving between different points in time, whether back to the past or forward to the future and its concept has stimulated the imagination a long time. H.G. Wells, a writer and visionary, was born September 21st, 1866 in Bromley, Kent, England. Considered a futurist, he was enthralled with envisioning ideas of what the world would look like many years ahead, and writing about them. Flight by humans and invasions by aliens were only two of his predictions pertaining to life in the future. In 1892, H.G. Wells wrote the science fiction novella, The Time Machine, bringing the idea of time travel to the forefront. 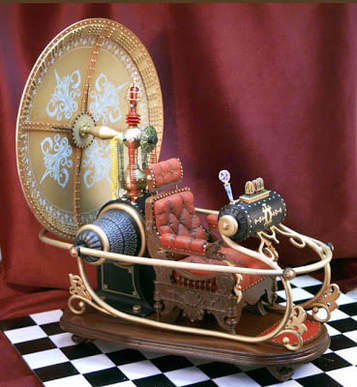 The vehicle used in the movie, The Time Machine had the power to selectively transport the operator to the past or future. Even though Wells wrote many books in different genres, he is mainly remembered for his works of science fiction, and is often referred to as the "Father of Science Fiction" along with writers Jules Verne (Journey to the Center of the Earth, written in 1864) and Hugo Gernsback (the first science fiction magazine publisher). At the age of nine, H.G. 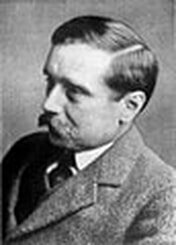 Wells (Herbert George Wells) became bedridden due to a broken leg. His father brought him books to read to help him pass the time, opening up huge vistas of unique worlds to his imagination. As a young man, Herbert tried different occupations. One was working long hours as an apprentice in a drapery factory, and the experiences there shaped his coming novels, such as The Wheels of Chance and Kipps. Both these books highlight the life of a budding draper. After that, he pursued a career in teaching, but continued his education after winning a scholarship to the Normal School of Science. Still, he had little money to live on, and this provided him with insight into the plight of the poor and society's distribution of wealth he would refer to in his writings. Serialized in 1897, his novel, The War of the Worlds, about martians invading the earth, soon appeared in hardcover. It has never been out of print. On October 30, 1938, as a Halloween radio drama, The War of the Worlds was broadcast on the Mercury Theater hour by the Columbia Broadcasting System throughout the United States. Using the format of a news bulletin, it is said the broadcast caused widespread panic when listeners believed the narrative was real, and that an invasion was actually a reality, happening in real time. However, the amount of panic it caused is disputed. Orson Welles, the star of the broadcast met with reporters the next day, on halloween, to let reporters know he had no idea the broadcast would create the hysteria it did. H.G. Wells wrote prolifically over sixty years, including short stories, fiction, non-fiction and articles. His famous novel, The Invisible Man, was published in 1897. In 1991 it was developed into a play in England, and again in 2010, also in England. H.G. Wells died in 1946 at the age of 79, in his home in London, England. A crater on the far side of the moon is named after him.